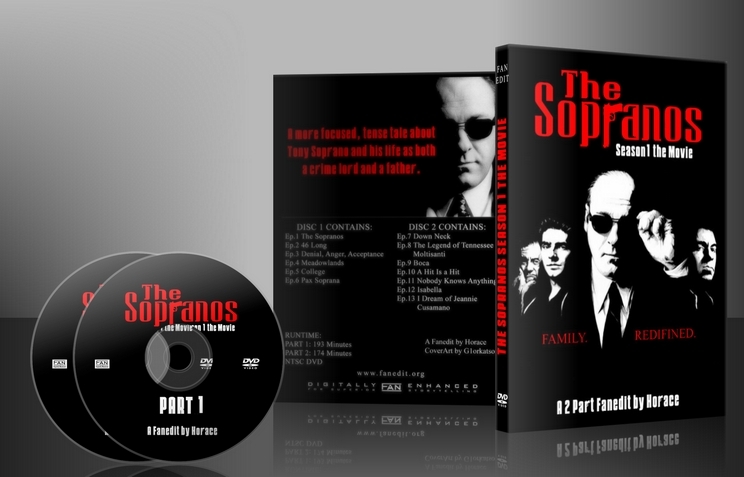 This fanedit takes Season 1 of the Sopranos and distills it into a more compelling and focused examination of Tony’s family and business which strips out the ‘filler’ subplots which distract from the main story. Up until now my only editing experience has been the Star Wars prequels (and ROTJ) where the goal was to salvage a (mostly) bad movie by removing childish and/or stupid content. Editing the Sopranos has been a totally different experience. My intention with this edit is to focus on the main story arc. My only complaint with the series is that it was bloated with unnecessary subplots that had no bearing on the main story. If you watched the series as it aired from week to week you may remember that some episodes were really exciting and full of tension while others seemed like filler material. I wanted to remove the filler while retaining the tension between Tony and his family, his business associates, and Dr. Melfi. Nothing of consequence has been cut (in my opinion) and I think it makes for a stronger story. I watched the entire season and took notes on each episode regarding what I wanted to keep and what I thought should be cut. Although this is cut into two long movies it still has an episodic feel. You can tell where many episodes end due to the dramatic music and a fade to black, so I’ll make the cutlist by episode. * I removed the references to Meadow going (or not going) to Aspen with Hunter. I also removed the scene where Carmella and Meadow discuss their traditional trip to New York. I wanted to cut down on Meadow and Anthony Jr. as much as possible without removing necessary information. EP3 - This episode was the first to allow for some heavier cutting. This would continue until episode 11 when the seasons events started to draw to a conclusion. * Cut the first two visits to Dr. Melfi. I thought the Tony/Dr. Melfi relationship was a little over the top. He is constantly storming out of sessions or telling her that he loves her. It lessens the effect of him really getting angry towards the end of the season. * Cut bedroom scene where Tony and Carmella discuss her fundraising dinner and the following scene where Meadow and Hunter are on the phone discussing buying crystal meth. I would have liked to cut this subplot from the movie entirely, but references to it are made during important scenes and removing them created severe audio issues. * Cut the scene where Tony visits Jackie in the hospital and hires a stripper to pose as a nurse. * Cut entire episode (Tony taking Meadow on tour of colleges and running into a former mobster who is now in witness protection) except for Carmella and Father Phil at house while Tony and kids are away. * Cut Tony and Melfi’s business suit discussion. All instances of Tony being attracted to Melfi have been cut. It is enough that Dr. Melfi being a woman adds to the tension between Tony and Carmella. * Cut Tony and Carmella’s tricky plan to get Livia out of her apartment at Green Grove Retirement Community. She is there being visited by Anthony Jr.
* Cut soccer coach subplot and anything related to it. Overall this was an enjoyable way of rewatching Season One, but it was way too long (6 hours). There’s a lot that could have been cut to make a tighter 3 hr “movie”. 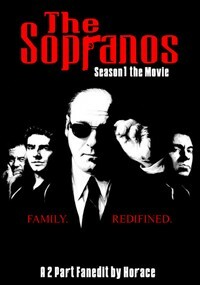 But if you’re a fan of Sopranos and don’t want to spend 11 hours rewatching the first season you’ll probably enjoy this. Big mark down on A/V Quality. This was released as a 4:3 .divx file with MP3 audio. It looked ok once I fixed all my settings to compensate for it. (The DVD was offline.) The editing was good, nothing stood out as jarring or abrupt, but it should have been cut down more. The Sopranos is one of my favorite TV series of all time. Even when it got a little out there with the episodes that were 90% dreams. It was always entertaining. Don’t get me started on the ending of the final episode though. But the writing and acting on this show are incredible. You could take out all the mafia stuff and be left with a great family drama. And there is so much comedy as well. When I rewatched the first season a while back, I realized how much of a black comedy it is in many parts. I am always interested in fanedits of TV series. For this edit I did not follow my usual practice of avoiding reading the cutlist before viewing the edit. Video Quality: The video quality was excellent. I watched Part 1 in the DVD format. Part 2 I watched in avi. There were no real jarring cuts. Maybe one or two of the fadeouts to black, the black screen could have maybe been a second or two longer. But i feel that everyone’s opinion differs on the length of a fadeout and it really depends on the two scenes it is between. So that is small potatoes and it never “took me out” of the viewing experience. The DVD menu design was simple enough with a nice motion menu, very nice menu! Audio Quality: I found no jarring audio, no audio dropouts. Every faneditor talks about the need for cross-fades and I definitely agree. But I feel that they don’t always need to be super long and have the audio from the previous scene bleed into the the next scene for too long. So again, no glitches or pops, and if cross-fades were used they were very shorts ones, which is fine, cause all you really need to achieve is smooth audio (and this was achieved with this edit). The edit flows very well. It is hard to remove the episodic feel of any TV series when turning it into a movie. But really for me, I felt that the episodic feeling was barely there. Which was a good thing IMO. I was sad that “College” was not in here (save for the Carmella and Father Intantolla scenes), as it is one of my favorite episodes (along with “Pine Barrens” and “Whitecaps”) but I agree with Horace’s choice as it is a stand alone episode and doesn’t fit with what his intentions were with the edit. And initially I wasn’t sure if the inclusion of Carmela and the priest was necessary. But it definitely serves a purpose. It shows Carmella’s feelings about Tony and his work. It also fills in potential plot holes in other key scenes that were in the edit. The decision to end part 1 with the ending of “Pax Soprano” was perfect IMO. And i love the instrumental from Xzibit’s “Papparazzi” in that end scene. The ending of the fanedit (part 2), is essentially the same as the end of Season 1 so I have no complaints there. Constructive Critique: So I have two small gripes. Not really a big deal in the scheme of the edit. But there is one fade to black scene (and the scene as it relates to the series is the end of an episode), for a split second and very faintly, you can see a bit of the end credits. This is really nitpicking, I know, and its not a big deal. The only other thing which is not a critique so much as just an editing decision I didn’t agree with is the inclusion of the end scene from the episode “Nobody Knows Anything” where Tony is standing by the water and i believe the bridge where Casian commited suicide and the song “Manifold de Amour” is playing (i love this song). Its just a very brief scene and didn’t think it was necessary to include. Alternately you could say it was good to include as maybe Tony is reflecting on the cop’s death. Anyway. Overall this is a great fanedit. A good way to watch the meat and potatoes of Season 1. I rate this fanedit 9/10! Great work Horace!